The focus of this week has been preparing for our trip to Brussels where we’ll be spending 3 days all working together on LXD before attending and presenting at FOSDEM. @brauner is making good progress on preparing for the liblxc 3.0 release, moving all the various language bindings and tools out of the main tree and into separate repositories. @monstermunchkin has also been busy working on our refreshed tooling for generating LXC and LXD images which will be replacing the dated template shell scripts in 3.0. On the LXD side, @freeekanayaka is hard at work fixing a number of remaining rough edges around the clustering branch and working with @stgraber to get things going through CI and in shape so it can be merged very soon. 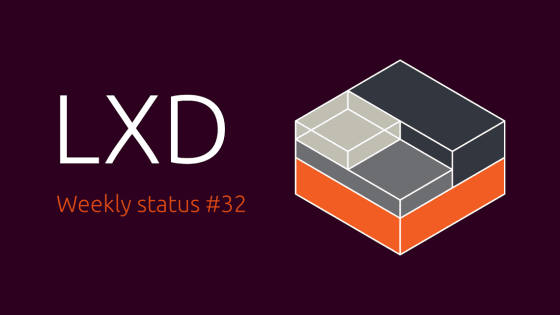 We’ve also been fixing a number of issues here and there to keep CI going and have been pushing a number of bugfixes and improvements to the LXD snap. We’re all looking forward to seeing some of you in Brussels later this week! Fixed an issue with the new proxy device failing in the snap. Fixed a documentation issue for the proxy device. Fixed test failures on Go tip. Fixed a number of coverity warnings and build issue on Android. Fixed error reporting in cgfsng. Fixed some issues with completely unprivileged containers. Replaced iproute with iproute2 in the Debian template. Cleaned up some of the seccomp handling code.